Tonight we had two special guests over for dinner, my mom and step-dad, Jimmy. I am a little surprised that the first pizza of mine that my mom tasted was #32. And I’ll admit, I was a little nervous making pizza for her since she is my pizza guru. My mom was a farm girl, born and raised in the mid-west, and therefore loves veggies! With that in mind, I used some of this week’s GFC veggies to create a pizza recipe I hoped she would love. I sliced and roasted beets with canola oil and salt. While the beets were roasting I sautéed red onion, garlic and kale, then steamed it a bit. My mom shared that she likes Fontina cheese, so I mixed Fontina and mozzarella cheeses, sprinkled that on a thin layer of sauce and topped it all with the veggie mixture. The moment of truth came as we sat down at the table. As most moms can, mine sensed my nervousness and dug in right away. She loved it! And it wasn’t that kind of love you fake when your kid makes something that really tastes like dirt. She’s not that kind of mom. She really loved my pizza! I now feel like an accomplished cook. 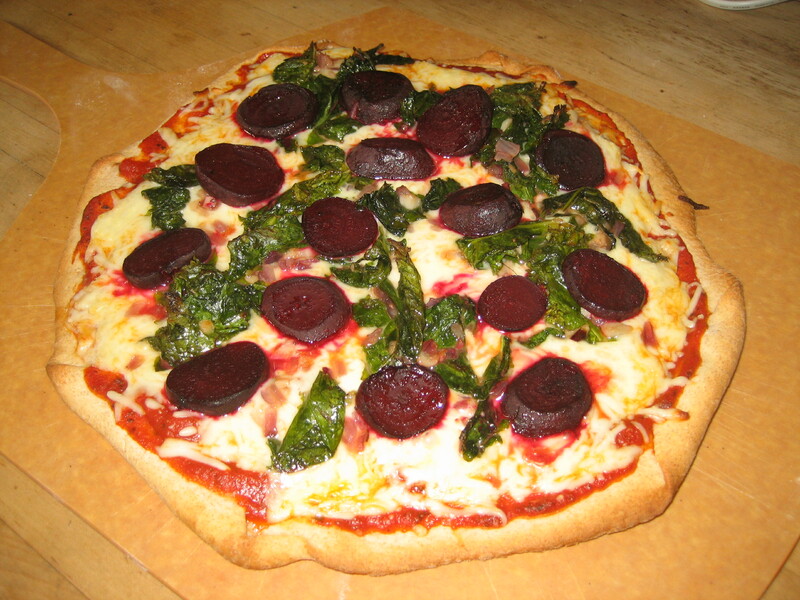 This entry was posted in beets, cheese, fontina cheese, garlic, marinara, mozzarella, Onion, sauce, Seasonal, Summer Recipe, vegetarian, veggie and tagged beets, cheese, kale, pizza, pizza recipe, The Good Food Collective. Bookmark the permalink. She speaks the truth – this was a surprisingly excellent tasting pizza. I would have never had the culinary guts to attempt such an odd combination, but it was really good. I’m going to start using beets and kale on my pizza at home. Thanks Dawn! I was surprised at how good it was, my mom too and she knows her food. At least you would try it, Jim refused! I learned through the ridiculous yumminess of my Mac n’ Cheese pizza that pretty much anything can go on a pizza!